The answer is neither black or white, nor fluorescent pink. However, in the spirit of this question we extend an invitation to all Common House user groups and individuals to come design with us collaboratively during these sessions. This invitation also extends wider to those interested in learning about printmaking in the intersections of politics and aesthetics, or art in it’s social context. In this way, we aim to counter the norm of ‘contracting out’ print and design, and see it as a playful way for activist groups to explore their politics further through the visual language used to communicate. Just to explain a little bit more, the Riso Print Club is not a place to just come print your own work, and for anyone looking for a print service, we can recommend Hato Press, Ditto Press or Footprints Workers Co-op. Our priority is getting people involved in working collaboratively and contributing to the running of the club. So we would ask that you come along and participate in what we do first, learn how the machine works and agree to teach other people how to use it in return. After that, it may be possible to print some of your own work but the emphasis is definitely on working collaboratively, creating a visual commons and becoming a contributing member rather than just a consumer. If this is something that interests you, we’d love to have you come join in. You need to supply your own paper to print on Ava the Riso. The machine can print on A6, A5, A4 or A3 and you can print on a range of paper stock from 60GSM to 200GSM. You can get cheap recycled paper from PaperBack. If you want to use Ava the Riso you need to get along to a training session – we are not running a printing service, but instead are facilitating a collective resource. Training sessions currently take place most Fridays (check the calender + Riso Club facebook page) as part of the Riso Print Club. No need to book, just show up. 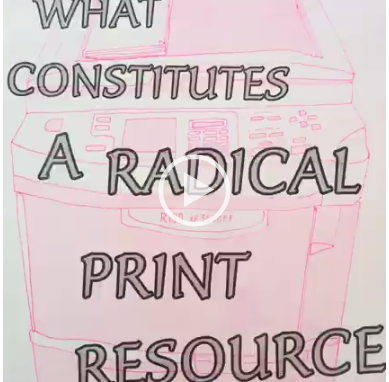 We ask everybody who uses Ava the Riso to donate at least one print to the Common House Riso Archive – an archive of radical print culture. Please caption and date your print on the back so that we can archive it. If your motive is of general nature and lends itself to be reproduced on different occasions then please also submit its file to the digital archive on the Riso computer.